Last week we enjoyed a beautiful Sunday Long Run with warm temperatures, sunshine, a dancing dog, Pepe Le Pew, and some frisky leopards all entertaining us during our easy week. Well enough fun, the cold temps have snuck back in. If we’re quick though we’ll beat the next snow storm predicted for Sunday. March starts with an 18 miler through Melrose, Saugus and Wakefield. The plan is a trip along the LynnFells Parkway to Breakheart, a water stop, a loop around the reservation, and out to the water stop again. From there you’ll head back along the LynnFells turning right at Main St in Saugus towards Wakefield. Run to Wakefield High School for another water stop. After the High School you’ll turn right on Water St and then a quick left on Montrose Ave. Follow this to the end and turn left onto Salem Street. This will fork at a gas station, you’ll want to keep right there to head to Lake Quannapowitt by the Ginger Bread Construction Company. Keep to your right and turn into the parking lot at Converse and find the water stop. Continue past Converse to a left on North Ave to a left on Church St. When you get to Wakefield Common go right and head down Main Street. You’ll find a water stop at Nick’s. After that you have three miles left to Brueggers for 18 miles. Shorter distance runners, the plan is out to Breakheart, around, and back the way you came for 9 miles. I’m not sure what Breakheart looks like these days, but if its a mess we’ll skip it and do a full loop of Lake Quannapowitt instead. If anyone has a clue whether its runnable let me know. I assume no but I’m not sure if we can run the flat side out and back. Water Stops: Typically we need three helpers for this run. I’ll be one person, who else can help. Ok, who’s in for the first Sunday Long Run of March? ROLL CALL! She must have heard your pleas, this week it’ll be above freezing. There is a slight chance of precipitation but not in the form of snow. This may be a first for 2014, a decent day to run. Thanks to all that helped out while I was away: Lois for stepping in and organizing. Jeff, Rick, and Tom for keeping the water flowing, and anyone else that helped out. So this week we step back a little with a 14.3 mile run for the long and a 7.2 mile short run. We’ll hit roads we’ve run before but in a completely different order to make you feel like you’re going somewhere new. We’ll start out Main St towards Wakefield and take a left on Franklin St. Run into Stoneham all the way to their Main Street, then go left there towards Spot Pond. There will be a water stop at Friendly’s on the right. After the water stop, if you’re running shorter go left at the lights after Friendly’s and follow that past the Stone Zoo to the left at Pond Street. At Grimsby’s go left onto the Lynn Fells Parkway. Follow that all the way past Melrose High School, take a right on Melrose Street and finish up with Main Street to Brueggers. Longer runners, you’ll go straight after Friendly’s staying on Main Street around the back side of Spot Pond. Follow that to Elm and come up to the Highland Ave/Woodland Ave rotary. Go right there to Highland. If I have waterstop help you’ll find it along Highland Ave. If not keep running down Highland to the rotary on the other end. Go left along the Fellsway East (you didn’t think we would skip those hills, did you?) . When you get to Grimsby’s turn left, yes left, up Pond St back to Spot Pond. Go right past the Stone Zoo and back to the Friendly’s water stop. After that water stop head back down Main St to Franklin to Main St in Melrose to finish up at Brueggers. Water Stops. I believe Jeff has the buckets. Let me know if you need me to pick them up or if you’re helping again this week. I hear you do a much better job at it than i do anyway. Ok, its time for ROLL CALL!!!! Who’s in? Mother Nature isn’t interested in negotiating. Me thinks she might see the cold and snow and ice as helpful to our preparations. Okay then. We might have another dousing of snow on our hands for Sunday morning. As long as we’re not competing with the snow plows, we’ll be running one of my favorite courses, in through the Winchester Highlands area for either 16.2 or 8.2 not-so-flat miles. We have our waterstops covered (thank you, thank you, Jeff R. and Rick C.). What do we need to do? Review the map(s). Know where you’re going. Get some rest where you can. Hydrate and fuel your body. Pick out your best winter layers. and Saturday night do a little dance for Mother Nature so that she doesn’t make it too dangerous for us to be on the roads Sunday morn. Who is in?? ROLL CALL! This season has been nothing but tricky, week after week. This week we have a foot of snow to contend with it. That’ll make Breakheart impossible to run so instead we’ll be running the alternate route for this week. Take a look at the map and know where you’re going. This week our good running friend Ed Bradford’s youngest son suffered a severe concussion in a fall while hiking. Sunday Morning Demi Dubois will have a card for anyone interested in signing it and will be putting together a care package for the Bradford family. Please keep the Bradford Family in your thoughts as their son recovers from his injury. Who’s in for this week’s run? Roll Call. After a frigid windy run last week, this week should be warmer and hopefully more comfortable as you step up to 14+ miles for the long run and 7+ miles for the short run. This week the long run will take you along the entire Law Enforcement Memorial Half Marathon held in Melrose around 1999. This race moved to Wakefield before eventually becoming the Run to Remember in Boston. 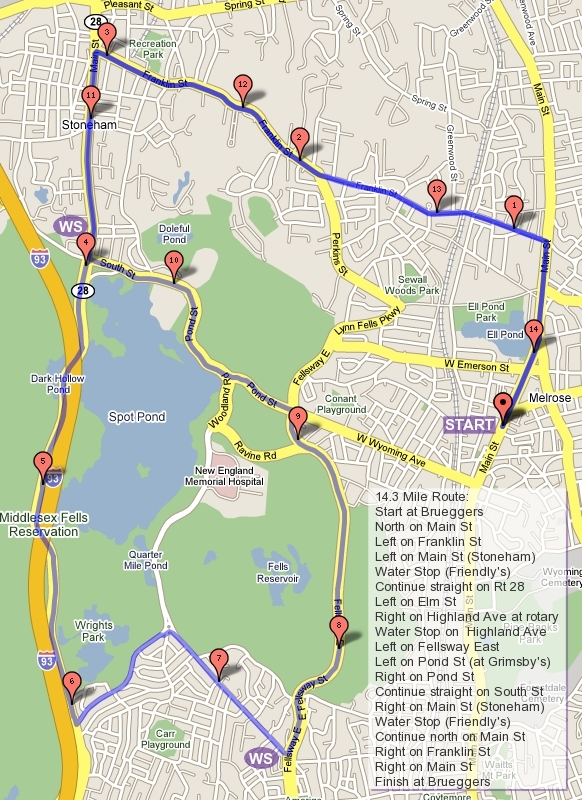 From Brueggers we’ll run over to the starting line bt taking Main St to Melrose St to the Lynn Fells Parkway. The race start was in front of Melrose High School and started with a loop around Ell Pond. If you’re running the shorter run continue along the Lynn Fells Parkway as the long runners turn left on Tremont Street, then lefts on Lake Street, West Emerson Street, Main St, Melrose Street and the LynnFells Parkway to complete the loop. Your next time past the tennis courts continue straight on the LynnFells Parkway to Grimsby’s where you’ll hit water stop 1. After water stop 1 you’ll run the same route as you did in week 3. Take the Fellsway East through the hills to the rotary at Highland Ave. Go right on Highland up to the next waterstop at the other end of Highland Ave. If you’re running short go right at the rotary along the front side of Spot Pond to Pond Street where you’ll turn right and head back down to Grimsby’s. This week you’ll go straight at Grimsby’s onto West Wyoming and ride the flat straight road back to Main St. Left on Main and you’ll be back at Brueggers in no time. If you’re running long loop the lake clockwise by taking a left on Elm Street and a right on Fellsway West up “Slackers Hill” and hopefully past a baton-free stretch to Straw Point where you’ll cut through the parking lot and past the Zoo along the front side of Spot Pond back to the water stop. From the water stop you’ll do as you did last time, left on East Boarder Road, left on the Fellsway East and continue back on to Lynn Fells Parkway. As you get to the high school you’ll keep going straight, although the race did a loop of the track that used to circle the football field. You’ll turn right on Melrose Street and right on Main back to Brueggers. Water stops… I’m sick 🙁 I don’t think I can handle a stop this week. Plus I don’t want to get any of you sick so…. Who wants to coordinate the stops? We’ll need two people. I can get you the buckets today or in the morning, but you’ll have to collect the money, start the runners off and then support the stops. Roll Call, who’s in for this week’s run?